Back in 2008, Tucker the black Lab was just another canine resident at SnoLine Kennels in Arlington, Wash. - until he caught the eye of Sam Wasser, director of the Center for Conservation Biology and the Conservation Canines at the University of Washington. 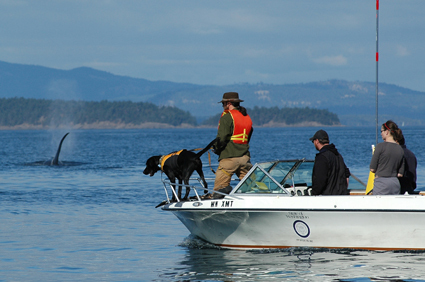 This proved to be a favorable personality trait, since Ayres and her team needed Tucker to stay put on a boat while using his stellar nose to sniff out killer whale feces that they could then collect and test for stress hormones back in the laboratory. With Tucker onboard, the scientists could stay as far away as 400 meters from the marine mammals, reducing any disturbance to the orca pods. The ultimate goal of Ayres' study was to test the levels of various stressors in killer whale populations. Her findings: Not having enough salmon to eat is a bigger deal for whales than having boatloads of whale watchers in their vicinity.